As you may have guessed by the over-the-top length of the list, this post is from Book Riot: 50 must-read books about unicorns. But I clicked through anyway because: Unicorns! While it’s true that dragons have a special place in my heart, and that I am especially fond of griffins, I do happen to have a great fondness for really well-done unicorns as well. Peter S Beagle’s The Last Unicorn ought to be first — unless titles are listed by publication date and then who knows. For literary importance, this is the title I’d put first. I think. I haven’t looked at the list yet, so maybe I’ll be surprised by recognizing something else that I would actually put before that one. [Update: nope, given all the books listed, this is still the one that strikes me as deserving the no. one spot in the Unicorn category. Okay, now let’s see what the Book Riot Post includes. This time I am almost completely certain Watership Down will not make an appearance. But no doubt many excellent unicorns will! I’m curious to see how many I’ve read and how many sound like something I must read asap. Good heavens, the first twenty — twenty — are picture books! Does anyone else think that’s cheating? Because my initial reaction is: Come on, that’s cheating! But of course I might feel differently if I happened to have children the right age to enjoy picture books. Eleven MG books about unicorns. Pip Bartlett’s Guide to Unicorn Training by — get this — Maggie Stiefvater (and Jackson Pearce). I didn’t know Stiefvater had done MG books. This one sounds fun. Nine YA books about unicorns. I see that The Last Unicorn is included here. Hmm. I am failing to understand why that is considered a YA novel. Because teens like it? Because … I can’t think why else it would be. Seems like a peculiar categorization to me. Birth of the Firebringer by Meredith Pierce, of course. I am perhaps alone in not finding that one particularly noteworthy. I disliked the protagonist. And finally ten adult novels about unicorns. Oh! There’s Ariel by Steven Boyett. Yes, I should have thought of that one. I liked it quite a bit. 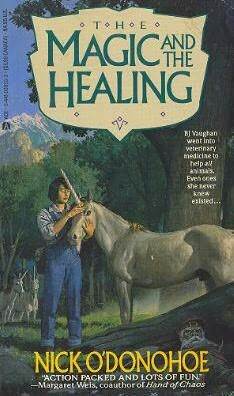 You know, this one is actually is a LOT more YA than The Last Unicorn. If it were published today, I’m sure it would be categorized as YA. Young protagonist, coming of age, dystopian background — definitely YA, no question. 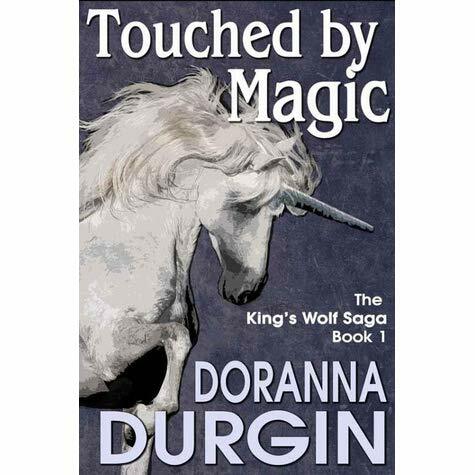 One more I recognize:Touched by Magic by Duranna Durgin. I do recall liking the book. I fear I don’t remember much about it other than the initial setup. I should re-read it. And one last one that I recognize: the new one by Beagle, The Unicorn Sonata. Haven’t read it. It’s on my radar, where no doubt it will sit for the next decade. Have any of you read it? What did you think? If any of you rave about it, perhaps it will move up closer to the top of the TBR pile. Equoid by Charles Stross? Novella from the laundry files, so naturally, the unicorn is a horrible monster. In the Laundry Files, the various eldritch horrors serve as a back drop to office politics and, well, making fun of Lovecraft. Stross has a pretty good sense of humor. I loved the Durgin books as a teenager but haven’t revisited in years—I should put them on the reread list as I think they’re available in ebook now. The unicorns were fairly limited in appearance but she does animals exceptionally well (I’m mostly remembering a late-gelded horse with a scarred hock and a Lot of Personality). I liked the protagonist of BIRTH OF THE FIREBRINGER a lot less but loved the idea of warrior unicorns and gryphons enough to overlook his frequently irritating missteps. Diana Peterfreund has a fun YA series about killer unicorns starting with RAMPANT, and I see it made the list! Also THE BLACK UNICORN and its sequels, I loved those. Unicorn Sonata isn’t all that new. (checks, 1st ed 1996) Loved it. So did The Teen. It’s ..hmm.. not what I expected, but good. But there’s In Calabria which is 21 years newer and also features a unicorn. It’s very good and very different, as the other two are from each other. “If the Lady [pregnant unicorn] was creature of purity and goodness, then her husband could only be even seen in the blackest and purest of rage.” from memory so probably not right. They shape the story, but it isn’t about them. I’ve read Meredith Ann Pierce, she’s not bad, some of her visual and sensory stuff is stunning, but her protaganists do seem a bit on the idiotic side. I read the Durgin not long ago but don’t remember much about it, must have been ok, since I did finish it, but I recall some dissatisfaction, too. I never finished that Rampant series – I gave it up in disgust a couple books in for having just the worst gender politics and handling of sexual assault and parental abuse. I ran out of characters to root for in it. Maybe it’s one of those ya books that works better if you actually read it as a teen?